The Acufinder.com Personalized Newsletter is Finally Here! Now all Acufinder.com Premium Members can send a personalized email newsletter to their patients at NO EXTRA CHARGE! Just log in to your account and invite as many people as you would like to receive a monthly newsletter about Acupuncture and Oriental Medicine along with your photograph and contact information. Newsletter is included with membership at no extra charge. Join Acufinder.com Now! Sent once a month. See our editorial calendar for publication topics and custom content submission deadlines. Learn more about our article contributors. Email marketing is one of the most powerful marketing tools available for today's acupuncture practices. Email marketing enables you to proactively communicate with your existing patients and prospects instead of passively waiting for them to return to you for treatment or call you on the phone. It is a highly effective way to increase clinic appointments and develop patient loyalty. Acufinder.com makes it easy by doing the work for you! 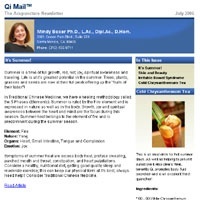 Once a month, your patient e-mail newsletter will be sent to your patients with 3-4 short articles about the benefits of acupuncture and Oriental medicine. Each article is specifically written for acupuncture patients. The newsletter will be personalized with your photograph and practice information. Everything will be done for you. This constantly reminds your patients about you and the benefits you offer. Success and profitability is all about creating loyal patients and driving interest, repeat business and referrals. Since it is roughly six to twelve times less expensive to sell to an existing patient than it is to acquire a new one, the value of patient loyalty and repeat business is just too compelling to ignore. A 5% increase in retention yields profit increases of 25 to 100 percent. Repeat customers spend, on average, 67 percent more than new customers. With email marketing you can solidify existing relationships, initiate new ones and convert your one-time treatments into repeat long-term patients or referrers. You can send your newsletter to an unlimited number of patients and "potential patients." Leave a signup sheet at your front desk; ask for email addresses when you do public speaking or at your local yoga studio. There are endless ways to take advantage of this great service! Your patients will receive an invitation to receive this Free Monthly Newsletter. If they do not actively accept the invitation, they will not be sent the newsletter.